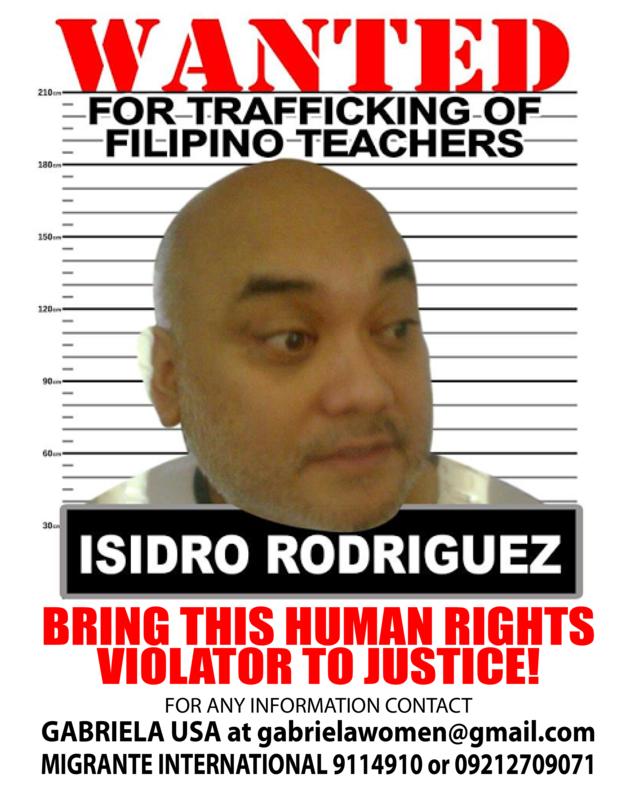 GABRIELA USA is calling on our members, community allies, supporters and friends to take action on Wednesday, May 21st, to oppose the release of recruitment agency owner and human trafficker, Isidro Rodriguez, and the incompetency of the Philippine government to serve their compatriots with justice and dignity. We are writing to ask you for your continued support for our Justice for Filipino Trafficked Teachers Campaign. Since 2003, batches of teachers have been illegally recruited and trafficked to the U.S. by Philippines-based recruitment agency owner Isidro Rodriguez. Case complaints have been reported to Philippine Embassy officials in the past as well as to the Philippine Overseas Employment Agency (POEA). 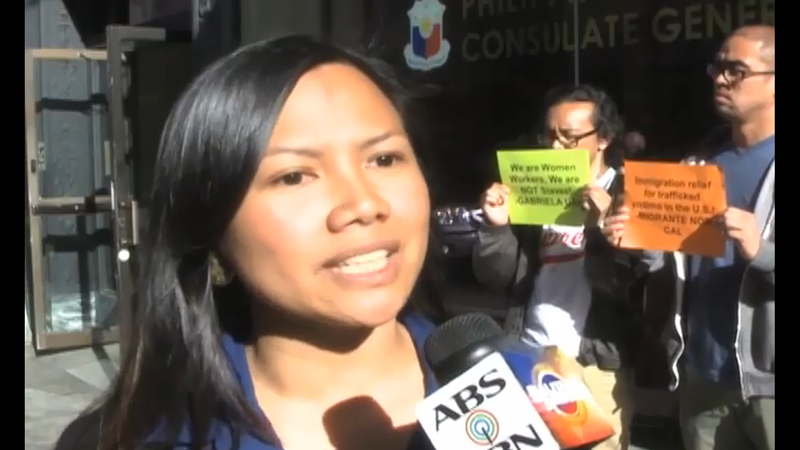 However, the response from the Philippine government has been inadequate and unsatisfactory. GABRIELA USA received confirmation from Migrante International that Isidro Rodriguez was released on May 8, 2014 due to the settlement of some teachers from the first batch, but this disregards a significantly larger number of teachers pursuing cases against him. Isidro Rodriguez was expected to appear before the Department of Justice on May 13th in the hearing of the trafficking case against him but failed to to show up. Prosecute Isidro Rodriguez and Investigate Philippine Government Institutions NOW! Just reparations for trafficked victims! Cancel teachers’ high interest loans NOW! Hold accountable loan sharks in cahoots with Isidro Rodriguez! Immigration Relief for trafficked victims in the U.S.! Phone and fax barrage to the Office of Ambassador Jose Cuisia and the consulate/embassy responsible for your area of residence. H.E. Ambassador Jose L. Cuisia, Jr.
Social Media Blitz to widely propagate the international manhunt on Isidro Rodriguez! 1) Follow the Justice for Filipino Trafficked Teachers Twitter account @j4FILteachers for updates, details and live tweets on May 21st. 2) Tweet your support and demand justice for the teachers!